In 2013 I had the pleasure of living in Australia for a year. While I was there, I discovered a couple of things about their adult beverage scene, the first of many lessons included the fact that I could drink an entire flat of beer on my own. Now, this is unusual, even for me, the reason for this being that Australia has some of the lowest alcohol content beers I have ever experienced. You can imagine my discontent at the realization of paying 55 dollars for a case of water. To say the least, I was not pleased. It was then, by recommendation from a lot of the expats living in the area, that I tried my first batch of “goon.” That’s right, goon. They take a foil vacuum sealed bag, ranging anywhere from 2-5 litres in size and fill it with wine. They throw a nice little spout on the end of the bag and package it in a box. You puncture the bottom of the box and your spout is in the perfect location for all night pouring. Now, why on earth would I pay $5 for a single “tinny” of piss beer, when I could get an entire cask of wine for the same price? You guessed it, the hangover. I could drink two bottles of fine wine, not know my name and wake up in a field feeling fine (not that I ever did that) (we’re just trying to set the scene here), but “goon” is in it’s own category of hangover. We’re talking about your entire face feeling like you’ve just had it transplanted, your insides have turned to tar and you could drain an entire lake from thirst, kind of hangover. It’s far from pleasant. It was painfully aware to me that something had to happen. I needed to find a new poison, or find myself in complete social isolation for the rest of my working holiday experience. I started paying attention to the international conglomerate around me, what were they drinking? What was I missing? It was on a cool evening in Bowen, Queensland that I was introduced to the beverage that would save me from eternal hangover. The Brits we’re drinking it by the caseload, and they were calling it cider. Now, my experience with cider was that it was something you drank in the winter, by a fire after a nice day of snowboarding; It was made by heating apples and adding cinnamon and spice and everything nice. Needless to say, everyone was a bit confused when I asked if they added vodka to it. I took my first Aussie sip and I most definitely haven’t turned back. I was telling everyone at home about this wondrous beverage I had discovered. I couldn’t get over it’s awesomeness, and wanted everyone I knew to try it. Unfortunately, at that time in Canada, the LCBO wasn’t stocking it. If you’re from Ontario, then you’ll know that this is our only source of alcoholic beverages, besides The Beer Store (and yes, that’s a store, the only store actually, where you can purchase beer in Ontario). Things sure have changed and boy, am I glad to be living in a Canada that has cider. I was actually a little apprehensive when I came back for my last visit. I thought it would be difficult, if not impossible to find my new drink of choice. Thank goodness everyone came to their senses, the cider scene is alive and well, and I couldn’t be happier. The problem I’m now faced with, as I’m sure many of you cider lovers are, is which one’s the best? Do I choose apple, pear or some random fruit flavour? How sweet or tart is it and how do they compare to one another? I think most people when asked to go out and pick up some cider, will most likely stand there in bewilderment at the selection available, and just pick one from a company they recognize and call it a day. That’s fine if that’s how you want to do it, but I don’t really roll that way. So, today when I headed out to the LCBO, I had two categories in mind that my ciders had to fit into. The first category being that it had to be Canadian and the second was that it had to be apple. True, I could have chosen any fruit flavour, but I thought we should start with the basics, so old school apple it is. There was no method to this madness. If it was apple and if it was Canadian I bought it. I was in Orangeville, Ontario at the time, so while I’m sure there are plenty more choices for everyone out there in Toronto or Guelph or Barrie, we’re just working with what we have here folks. Besides, drinking seven tall-boy cans of cider, alone on a Monday night was a bit of a task in itself, but hey, it’s all in the name of research, right? 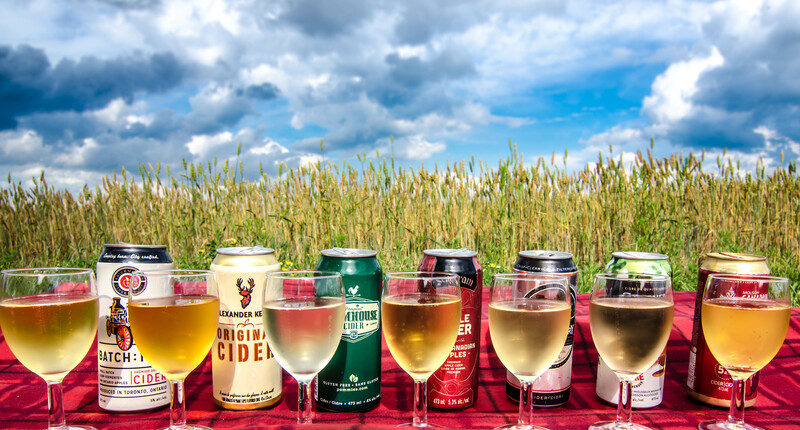 Brick Works Cider House Batch: 1904 Premium Dry Craft Cider, Alexander Keiths Original Cider, Pommie Farmhouse Apple Cider, Seagram Apple Cider, Thornbury Premium Apple Cider,Premium Cider Growers Honey Crisp Apple, and Molson Canadian Cider. Before this point, I had only tried the Alexander Keiths Original Cider, the reason for this being that it is Keiths, a Canadian classic and I was excited that they were breaking into the cider market. So the first thing I did here was split these into categories, I went with my first impression and arranged them in groups of sweet, medium and tart. Before we get into this, I will say that obviously everyone is entitled to their own opinion and everyone has their own taste profile. So I’ll pull out the general items for you, then get into my opinions about each. The Sweet: It should be noted that I am able to pull out something sweet within seconds, but keep in mind that all ciders have a bit of sweetness to them. They are, after all, made from apples. These ones stand alone from the group, but each one is just as different within this sweet group. Segram Apple Cider: Segram has the right idea here for marketing a cider towards a person who might be inclined to drink coolers, or mixes. This beverage has a taste of apple and the sweetness of pear with a mix of some added spices. Its medium in colour department and not too heavy on the fizz. I would be inclined to call this a “Hard Apple Juice,” instead of a cider and would recommend it for anyone looking to make a transition from coolers into the cider market. Molson Canadian Cider: The people at Molson have the right idea here. It’s pretty heavy on the sweet, and a little lower on the bubbly side. It was like they took a batch of apple sauce and ran with it. This cider has a nice golden colour and is packaged with Canadian spirit, an excellent intro to the cider world for anyone coming from beer land. Premium Cider Growers Honey Crisp Apple: This cider is the smoothest of the smooth, and had me instantly thinking, is there any alcohol in this? Its soft and light and doesn’t attack your tongue or front pallet with bubbles. It has a lingering sweetness that makes you head back for that next sip. It’s light in colour and outrageously refreshing. I’d go so far as to call this sweetie dangerous, before you know it you’re 3 drinks into it and yes, it’s alcohol! The Medium: These bad boys are right in the middle. They have that slight sweetness mixed with the right amount of tart, they’re pretty well rounded and have a balance to them that won’t give you heartburn or have you running for your toothbrush. Alexander Keiths Original Cider: The people at Keiths really put some time into this one, it’s pretty complex on the tongue compared to it’s contenders of the sweet category. There are no instant front notes on this one, nothing that slams you with an instant opinion, instead you get apple, flower blossom and hints of citrus. It’s not too dry and and not too sweet, but I’m sure that somewhere in this mix theres a bit of honey. I would recommend this one everyone. I think this is the best all around cider for anyone without a distinct taste preference. This cider may even be able to sway the most dedicated beer drinker over to team apple. Brickworks Cider House, Batch:1904 Premium Cider :This is an excellent rendition of a traditional UK styled dry cider, except they use 100% Ontario handpicked heritage apples from Georgan Bay and Niagra. There are no masking tastes here, this is about as fresh and clean as it gets. This cider is the only of its kind within this group of Canadians. It’s exactly what I would expect from a traditional UK cider, but it’s coming out of a Ciderhouse in Toronto. If you want something light, tart and refreshing, this light sparkling beauty is exactly what you’re looking for. The best way to describe this unique taste amongst its fellow Canucks, is for me to call it a Cider Spritzer. It’s not as heavy on the apple as it is on that crisp soda water taste, if you’re a traditional cider drinker, or you’re looking to discover that traditional cider taste, this pick is for you. The Tart: There’s very little sweet amongst this crew, these guys have a heavier alcohol content and will have you instantly puckering your lips. Pommies Farmhouse Cider: If you’re a dry white wine drinker looking to get into a cider, this may be your pick. My instant thought was that this is an “apple wine.” It has tastes of dried apple, white flowers and apple peel. It’s brilliantly clear and comes with an instant fading white head. Pommies is the leader in this tart category, it’s sophisticated and crisp, and would be a great pairing to any summer deck adventure. Thornbury Premium Apple Cider: There’s no sweet to this sour. In fact, the best way to describe this one is that it’s like someones punching you in the mouth with Granny Smith Apples. Its super sparkled and outrageously dry with hints of Macintosh. I’ve been trying to keep my personal opinions out of it, but I think it’s shining through here, this is my least favourite of the Team Canada Ciders. I’m sorry. So what can we gather from all of this? It all comes down to your own personal taste. I think the best overall guy on the roster is Alexander Keiths Orignial Cider. If you ask me what my pick is, I will tell you that hands down, its the Brickworks Cider House, Batch:1904 Premium Cider, but I’m a traditional UK cider fan. I think all of these ciders have a place in the apple scene, it just depends on what you’re looking for and what your personal preferences are. Either way, you can very easily get yourself out there and have your own little taste test. It’s the only real way to discover your own favourite Canadian Cider. I know I missed a bunch of contenders here on our Canadian Cider roster. 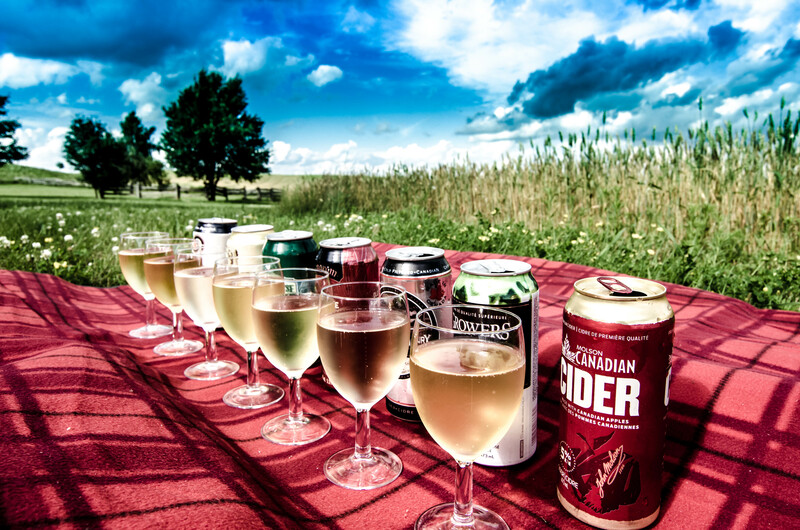 So send me your recommendations for my next Great Canadian Cider Adventure! I’m looking to taste them all, and help everyone out of those awkward head scratching moments, inside the walk in cooler at the LCBO.